Our Delaware genealogists are available to research on location. They will find and analyze the best records available to further your family history research. They can search the archives and libraries in Delaware, as well as help you with other special requests. Our researchers are available to visit local archives and libraries to access unique record collections to help with your research. Below is a list of a few of the archives our Delaware researchers have access to. The Delaware Historical Society is an important repository for records of early Delaware settlers. Some of their articles include colonial records, newspapers, church records, state records, as well as records from the American Revolution and American Civil War. The library contains a surname file with over 100,000 entries, family history records, and census records. Their manuscript collection numbers at over 2 million documents that date from the late 1600s to the present. These manuscripts include documents from early Delaware leaders such as Caesar Rodney and George Read. The Special Collections Department at the University of Delaware contains an extensive collection of materials, both rare and specialized alike. The archives include books, manuscripts, maps, prints, photographs, broadsides (i.e. posters) and pamphlets. The strength of their collection is their articles on the history of Delaware, but they also contain information on the history of science and technology and American literature. The Delaware Public Archives are responsible for all the non-current records of the State of Delaware. Their holdings contain documents from the Swedish colonial period (1638-1655), the Dutch settlement (1655-1664), the Duke of York regime (1664-1682), and the Penn Proprietorship (1682-1776). The are original and microfilmed documents located here. The archives also maintain a library based solely on Delaware that consists of state publications, books, genealogies, pamphlets, maps, newspaper clippings, and photographs. The Delaware Office of Vital Statistics contain Birth records since 1938, Death and marriage records since 1969, Divorces since 1935. Marriage and death records more than 40 years old (More recent records are maintained by the Office of Vital Statistics). Business records of farmers, and craftsmen dating from 18th century. The Wilmington Public Library is best known for its “Delaware Index” collection, which functions as a subject and biographical index for the Wilmington Morning News and the Evening Journal. Selected books on Delaware’s history are also included in this index. The majority of articles indexed here date from the 1920s to 1979. However there is a limited amount of articles dated from the 1880s to the 1920s. Obituaries for prominent Delawareans are included here as well. The Hagley Museum and Library has been referred to as a “second state archives”. The library works to document the history of a variety of businesses and the way these businesses have interacted with cultural, political, and social aspects of our society. The Hagley Museum and Library is home to a unique manuscript archive that numbers at over 2,500 separate collections. The history of more than 1,000 business firms are documented here. The Henry Francis du Pont Winterthur Museum Library contains the largest selection of national census records in the entire state of Delaware. Their archives include genealogical and historical information for Delaware and nearby states, including New York and other states in the New England area. The library holds over 100,000 manuscripts of 17th, 18th, and 19th century origin. These include microfilm copies of original papers from all over the United States and abroad. The library also holds a large manuscript collection dedicated to the history of American decorative arts. 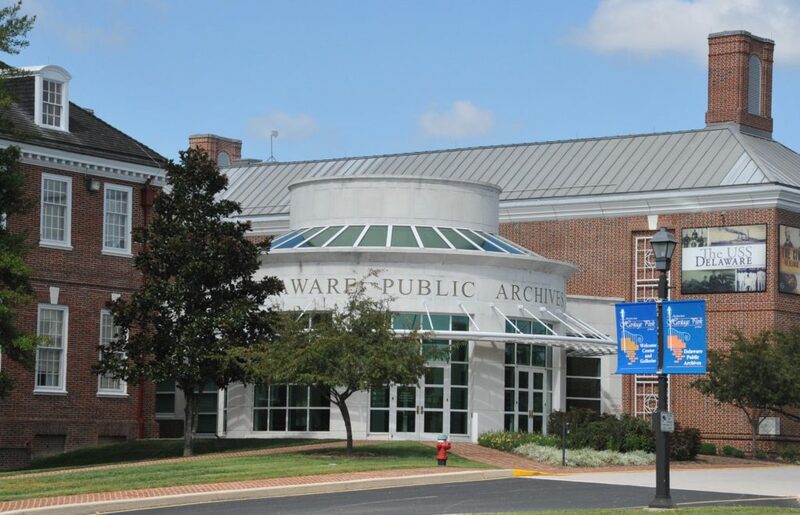 The Nabb Center for Delmarva contains over 4,000 volumes on history of Chesapeake region and more than 2,000 reels of microfilm of Delaware, Maryland and Virginia newspapers, census, land, court and church records. The New Castle Historical Society provides town histories, history of Italian-Americans, wharf, shops and merchants in the town, African-American life, Trustees of New Castle Common, and the architecture of the town. Barratt’s Chapel in Frederica, Delaware, houses a research library emphasizing Methodist history and the archives of the Peninsula-Delaware Annual Conference. It also contains records from the 18th Century-present, including membership records of closed churches, annual conference records, sermons, memoirs, and personal papers. There are other excellent resources for genealogical research of Delaware ancestors located in archives outside of Delaware. We have genealogists working all over the country who can investigate archives in other states for information about your ancestors. Below is a short list of a few archives outside the state of Delaware our researchers can visit. The Allen County Public Library is the second largest genealogical repository in the United States and the largest collection of genealogical materials held in a public library. Its archives include more than 350,000 printed volumes and 513,000 items on microfilm and microfiche. A selection of this massive archive is devoted to genealogical materials from the eastern seaboard area, including a section on Delaware. The American Swedish Historical Museum is located in southern Philadelphia and is the oldest Swedish museum in Philadelphia. The museum is dedicated to preserving and promoting Swedish and Swedish-American culture and traditions. The museum’s archives include information about the New Sweden Colony that was established on the Delaware River in 1638. The museum also contains articles that focus specifically on Swedish heritage in the Delaware River valley area, including northern Delaware, southern New Jersey, and southeast Pennsylvania. The Free Library of Philadelphia holds many historical books and manuscripts about Delaware, as well as information on the Quakers. There are also biographies, lists of published genealogies, and local Philadelphia newspapers from 1719 to the present. Philadelphia ward and fire insurance maps from around 1859 to the present can also be found here. The Historical Society of Pennsylvania is known for having more articles with information about Delaware’s early history than any repository in Delaware. Some of this information includes data about early settlers such as the Quakers, the Germans, and the Scots-Irish. There are articles from each of William Penn’s colonies: Pennsylvania, New Jersey, and Delaware. These archives are also significant because they contain materials that date back to the 17th century. They include letters, diaries, account books, deeds, and scrapbooks. All in all, the society’s holdings number at 600,000 books, 20 million manuscripts, over 300,000 graphics items, and 300 years worth of newspapers.